It seems like a simple question. The United States has been at war with Al Qaeda for nearly 10 years, and Al Qaeda has been at war with the United States for even longer. With thousands of lives lost and trillions of dollars spent, surely there should be a single, clear answer to the question of identifying the enemy. But it's not that simple. Not only are there sharp differences among different interest groups -- such as government (including contractors), academics and the media -- regarding exactly what comprises Al Qaeda, but even within those groups there is no consensus on key questions. I have observed this anecdotally for some time, but I wanted to put some preliminary data on the question. With massive help from Clinton Watts of SelectedWidsom.com, a survey was created. Clint also provided the charts below. 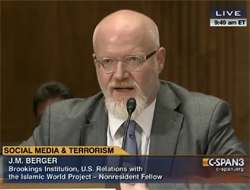 What groups are included in the U.S. mandate to wage war on Al Qaeda? It will take a few posts to process and present these results, then at some point I will make an effort to write something more ambitious dealing with the big picture. This post will feature the results of the first question, "What is Al Qaeda?" The question was presented with a series of descriptive sentences describing partial definitions of Al Qaeda on which respondents could vote "yes" or "no" as to whether the criteria met the definition of Al Qaeda. The results are below. I have highlighted questions where less than two-thirds of respondents agreed on the answer in yellow, and questions that are close to a 50-50 split in red. Virtually all serious responses agreed, by about 90 percent, that people who have sworn bayat to Al Qaeda's emir should be considered part of Al Qaeda. More than 80 percent agreed that extremists who take orders from Al Qaeda's emir (regardless of oath) and Al Qaeda's officially sanctioned franchises should be included in the definition of Al Qaeda. More than 80 percent agreed to exclude people who only take part in Al Qaeda's social movement and Islamic extremists when being based in the Af-Pak area was the sole criteria. From there, things get interesting. On the question of whether ideologues who explicitly justify or defend Al Qaeda ideology and tactics without strong operational ties to the organization, the split was 72.5 percent voting "no" to 27.5 percent voting "yes," slightly less than three-quarters agreeing to exclude people in this category. While a clear majority, the split here shows a significant amount of dissent. Real divisions emerged on the question of organizations whose leaders have publicly expressed loyalty to Al Qaeda or its emir, without being formally sanctioned franchises using the Al Qaeda name. Only 60.6 percent said yes, with 39.4 percent voting no. 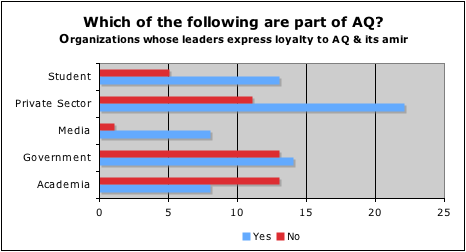 That represents very weak support for the most visible group that fits this criteria, Al Shabab. (The results were different when asked about Al Shabab specifically, as we will see in a subsequent post). Respondents were split 50-50 on the question of nominally independent extremist networks that provide significant services used in Al Qaeda operations, such as training camps or money laundering. This gets into a whole host of organizations and sticky questions about people which will be touched on in follow-up posts, but for now I will just note that the people guiding U.S. drone activities seem to be following a philosophy that such networks can be targeted under the "war on Al Qaeda" mandate. The two questions which lack a two-thirds consensus represent significant theaters in which the U.S. is operating fairly aggressively with an inclusive definition despite a lack of consensus on whether those groups should be considered part of Al Qaeda. This indicates to me that we need to be having more conversations about how our definitions impact policy. An important element of this discussion is looking at how different interest groups qualify their definitions of Al Qaeda. On the question of whether groups significantly financed by Al Qaeda should be considered part of Al Qaeda, 57 percent of academics voted yes, compared to 63 percent of government respondents. That represents a significant lack of consensus. Students voted yes by 67 percent. In comparison, media and private sector respondents (including a large number of people working in security-related fields but not direct government contractors) voted overwhelmingly -- more than 81 percent -- to include Al Qaeda-financed groups in the definition of Al Qaeda. That represents a meaningful disconnect, especially in the media sector which is charged with translating government and academic views on Al Qaeda for the general public. Fracture lines also emerged over whether groups whose leaders have declared their loyalty to Al Qaeda should be considered part of Al Qaeda. Students and private sector respondents were again much more inclined to classify such groups as part of Al Qaeda, voting yes 67 percent of the time. The media overwhelmingly voted yes on this question too. In contrast, academics voted no by a margin of 61 percent, and government responders split almost evenly down the middle. Given the amount of activity around Al Shabab recently this is an extremely interesting result, although Shabab has other qualities which debateably could lead someone to include it under the umbrella of AQ. The sharp lack of agreement among government responders also raises some significant questions, although the sample size is too small to make sweeping conclusions. A rigorous survey of government workers from the street level through the policy level would no doubt produce some very interesting results as well. On the question of whether "nominally independent extremist networks that provide significant services used in Al Qaeda operations, such as training camps or money laundering," sharp differences again emerged depending on profession. Academic responders voted no by 71 percent, while government responders voted yes by a slim margin of 51 percent. The media responders were almost evenly divided, while private sector and student responders voted yes by about 60 percent. This question is particularly interesting in light of the case of Abu Zubaydah, who is or is not a member of Al Qaeda depending on who you talk to. Depending on who you talk to, Zubaydah's training camp and logistics operations would potentially fall under this description. The U.S. government has traditionally come down in favor of classifying Zubaydah as part of Al Qaeda. Even though government responders voted yes on this issue by the slimmest of margins (one vote), in question three of the survey, to be discussed in a later post, government responders overwhelmingly classified Abu Zubaydah as part of Al Qaeda. Given the relative importance of academia as a rigorous process for examining the evidence about Al Qaeda and government as the main implementer of action based on these definitions, I am breaking out their responses below for comparison to the overall field. All numbers are percentage of "yes" responses. Isolating these two important groups highlights notable failures to arrive at consensus with more categories being disputed and the splits being closer to even. The average "consensus" on all questions asked (averaging the majority scores from each response) works out to be 74.4 percent. Academic responders average consensus score was 78.1 percent, somewhat higher. The average consensus for government responders was 71 percent. Government responders came from different sectors of government, which no doubt accounts at least in part for the lower score. Question Two: What groups are included in the U.S. mandate to wage war on Al Qaeda? Jihad Joe Review At Zenpundit: "A Book To Admire"